Volunteer efforts are ingrained in ALCC’s culture. In its 50 years, the Associated Landscape Contractors of Colorado (ALCC) has established a long history of supporting communities, sponsoring and leading projects throughout the state. Those community projects have included numerous undertakings over the years. 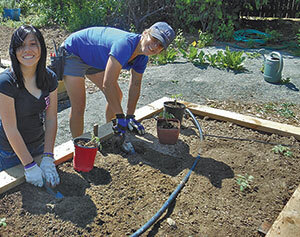 In 2012, ALCC efforts included the installation of an edible garden at Excelsior Youth Center, a school for at-risk teenage girls. Fefes says many of the projects stand out in her mind, but this one had a powerful impact. There were other efforts, as well. At Poudre Valley Hospital, the Northern Chapter of the ALCC took on a project in which 14 volunteers transformed a parking lot into a healing garden to benefit both patients and staff. It involved installing irrigation and hundreds of shrubs and grasses. The Southern Chapter took 34 volunteers and transformed a field of weeds at a behavioral health services center into a community gathering place for the disabled, seniors, high-risk youth and veterans. As the ALCC chapters continue to embrace community involvement, Fefes says she feels it’s now “in their blood” and something they will continue to do. Fefes says that by this point, community involvement is ingrained in the ALCC and that its members consider volunteering to be part of their membership. “I see the interest in volunteering as something that’s an ongoing part of our future,” she says. 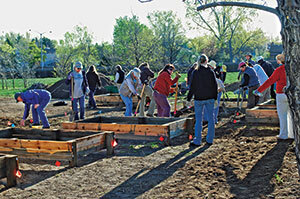 ▶ Excelsior Youth Center—In 2012, 24 volunteers from the Denver Chapter designed and installed an edibles garden within a larger master-planned garden at this school for at-risk teen girls. ▶ Poudre Valley Hospital—Last year, members from the Northern Chapter transformed a parking lot into a healing garden that included irrigation and hundreds of plants. ▶ Aspen Pointe Enterprises—Thirty-four Southern Chapter members turned a weed field into a community gathering place, with support from 18 suppliers. Landscape Management is the media sponsor of the Professional Landcare Network’s (PLANET) Community Stewardship Award. We’ll feature each of the program’s winners January through June. For more information or to read about the other winners, visit landcarenetwork.org/awards/communityaward or landscapemanagement.net/givingback.